The need to add semantic information to web-accessible services has created a growing research activity in this area. Standard initiatives such as OWL-S and WSDL enable the automation of discovery, composition and execution of semantic web services, i.e. they create a Semantic Web, such that computer programs or agents can implement an open, reliable, large-scale dynamic network of Web Services. 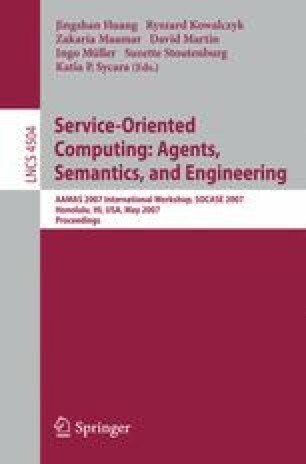 This paper presents the research on agent technology development for context-aware execution of semantic web services, more specifically, the development of the Service Execution Agent (SEA). SEA uses context information to adapt the semantic web services execution process to a specific situation, thus improving its effectiveness and providing a faster and better service to its clients. Preliminary results show that context-awareness (e.g., the introduction of context information) in a service execution environment can speed up the execution process, in spite of the overhead that it is introduced by the agents’ communication and processing of context information.